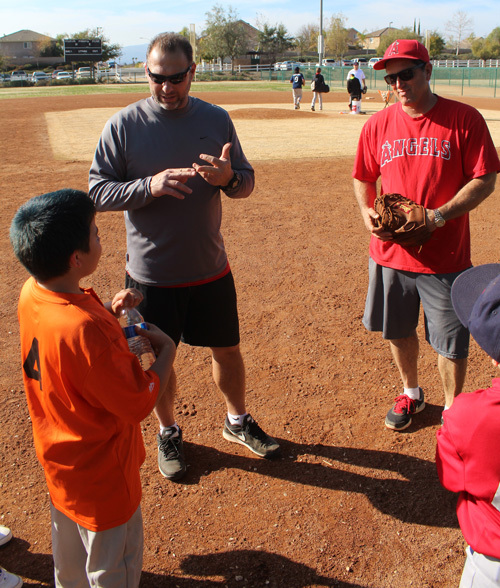 Former major leaguer and current Angels hitting coach Dave Hansen works with players from the Murrieta National Little League. "Hey coach, it's 5-4," the Little Leaguer shouted to Dave Hansen, 15-year major leaguer and now hitting coach for the Los Angeles Angels of Anaheim. "I didn't know we were keeping score," Hansen said with a smile. "Let's just play and have fun." 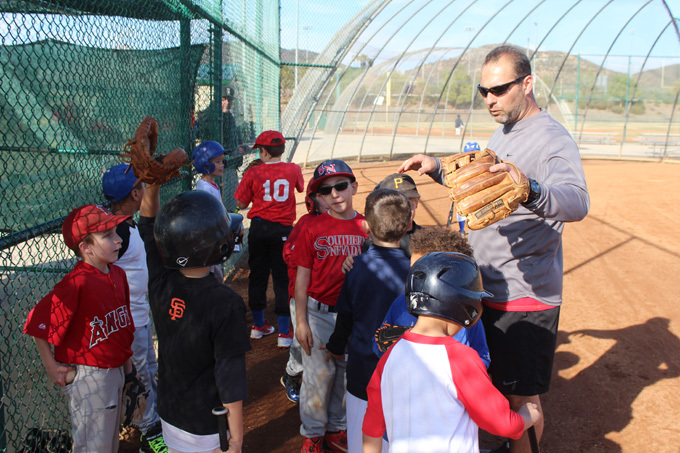 Fun was the theme of the second annual Dave Hansen Baseball Camp, sponsored by the Murrieta National Little League Saturday at Los Alamos Sports Park. But there was also a lot of instruction and support provided by Hansen, who became famous as a record-setting pinch hitter with the Dodgers, and former major league catcher Dave Schmidt. 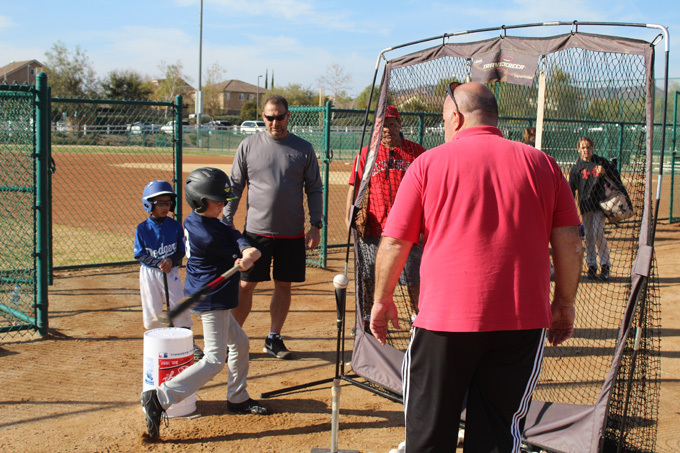 Youngsters who are preparing for the upcoming season of the local Little League listened to tips, worked off a batting tee, practiced fundamentals and played an informal game under the direction of Hansen, hitting coach of the Dodgers and Seattle Mariners before being named the Angels' new hitting coach last fall. Hansen and Schmidt were patient, supportive and encouraging on the field, then took time to sign autographs afterward. 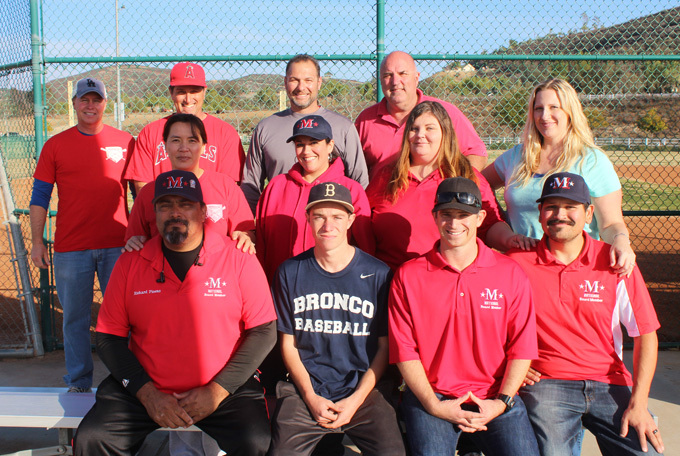 A friend of Murrieta National coach David French, Hansen helped the league raise funds for equipment and to cover other expenses while sharing his knowledge with the players. "The number one goal is to have fun, bring them together and plant a few seeds about some fundamentals of baseball they can use later in their careers," Hansen said. "We're keeping it in the development perspective -- foundational movements, correct arm action, that kind of thing. We try to take away the pressure of it." The game at the end of the day-long camp gave every player a time at bat in every inning, with Hansen pitching soft tosses. As the players circled the bases, taking advantage of every missed throw, Hansen offered praise and direction. Noting the enthusiasm of the players, Hansen encouraged the optimism. 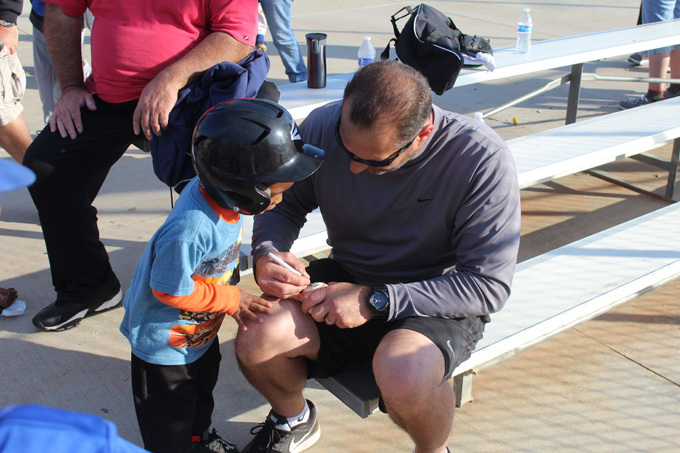 One young boy walked up to home plate with bat in hand and asked Hansen, "Can I go play in the field after I bat?" "Sure, if that's what you want," Hansen replied. The boy smacked the next pitch up the middle and took off toward first, still holding the bat. Halfway there, he tossed the bat aside, ran to the dugout, picked up his glove and ran out to a defensive position. "I didn't mean right then, but OK," Hansen said with a smile. Later talking about the boundless enthusiasm of the players, Hansen couldn't help but smile. "If you can't feed off of that, there's something wrong," he said. "The kids have unbelievable energy. And that's kind of why we play the game, isn't it? You get to the see the essence of the game running around the bases. For me, that's the most humbling part of all." Among the many players who asked Hansen for an autograph after the event was 4-year-old Champion Weathersby (above), the youngest player in camp. Moments earlier, Hansen had knelt just a few feet in front of Champion, lobbing soft tosses until the boy could make contact and run all the way around the bases. "To Champion. Dream big. Dave Hansen." It was a day the youngsters won't soon forget. 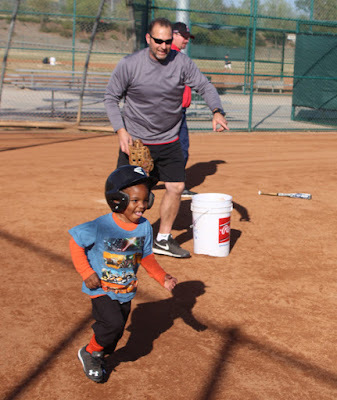 For more information about Murrieta National Little League, visit their website here or their Facebook page. Dave Hansen and Dave Schmidt (top row, center) pose with leaders of the Murrieta National Little League.